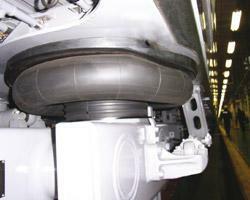 High quality and safe anti-vibration suspension systems for a wide range of railcar vehicle undercarriages, high-speed and intercity trains, metros and trams. Part of the secondary suspension system, Air Springs play an important role in isolating the vibrations which naturally translate from the rail through the steel components of the undercarriage. High quality Air Springs provide damping by controlling both vertical and lateral movement. This brings comfort and stability to the passenger and also helps to reduce noise and vibration. Bridgestone carefully selects the most suitable Air Spring for the needs of each application. 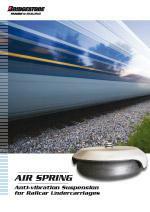 Our Air Springs are manufactured in our own factories in Japan and are used worldwide, on high-speed trains such as the famous Shinkansen Bullet train in Japan as well as on urban railways and metros in Europe, India, China and the US. © 2015 Bridgestone Engineered Products of Asia Sdn Bhd.